I may have figured out my issue. Just curious if others have had this problem. When reaching max boost (Diablo Tune holding 18 psi) the car does not pull smooth. Boost solenoids area with vacuum hoses would pop off sometimes. Zip tied them and still had the issue. Positive Battery post came loose and the issue increased at mid range RPM's. So this led me to believe it was electrical related issue. Battery terminals have been tighten down and voltage is reading 13.1 on normal driving. Goal is to swap out the MSD ignition coil pack and spark plugs. What plugs should I run? Best Gap? Planning to go with a stock coil pack instead of a new MSD coil pack. NGK 4306, start at .035 for gap and go from there. The MSD coil has been known to be problematic, good call on going back to stock. DiabloSport tuned by Brian (Mindmelt101) at Drag-On Resources. NGK 4306 plugs are not expensive so that works for me. Cool thanks Gizmodo. Is swapping out the MSD Coil pack back to stock simply as unbolting it and unplugging it? Or does the MSD coil Pack use a different harness? I keep reading about a harness required for the MSD...something about flat terminals versus round terminals. Swapped out the coil pack and plugs with NGK Iridium Gapped @ .035. Worked for a bit but the spark blow out is back. I hope this is spark blow out I am experiencing. Plug wires are next....stock wires? Gap NGK Iridiums @ .030? There is no reason to use those plugs, the NGK 4306 work just fine. New wires isn't a bad idea. Is that actually a Mopar coil pack? Are you getting any CELs for misfire? Store did not have the 4306 in stock. So I went with the Iridium's. Current wires on there are MSD 8mm red wires. I have recently installed a DCR coil pack shield. Turbo manifold does not have the heat shield. So wires are next along with gapping the plugs down to .030. Car does feel more responsive with the tune up thus far. 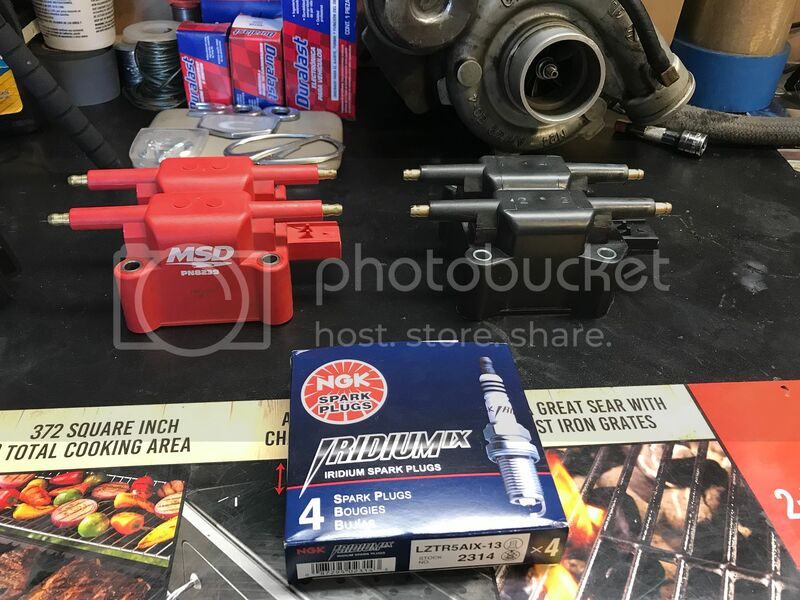 Coil pack is a Duralast coil pack from Autozone. No codes....would a check engine light come up? Or would I have to connect via HPtuners to see it on this platform? If the check engine light isn't on you won't get any codes. You can turn the key on/off/on/off/on and leave it there and you'll see codes in the mileage. Don't start the car, just accessory on. I wouldn't run anything but a Mopar coil. Gapped the plugs down to .029 and this helped remove the "studdering" during acceleration. However it comes back sometimes. I still need to swap out the MSD wires so hopefully that will help. Again the wires look new so I may have to go down on the gap some more....hope not.